If you didn’t catch Saturday night’s main event between Michael Bisping (Pictured) and Jason “Mayhem” Miller, you didn’t miss much if you were to ask UFC president Dana White. Nonetheless, ESPN has released the highlights from the lopsided scrap for your viewing pleasure. Things were looking good for Miller early on, as he had Bisping pressed against the cage for much of the opening round. Unfortunately for the bleached-blond middleweight, that was pretty much all he had to offer. 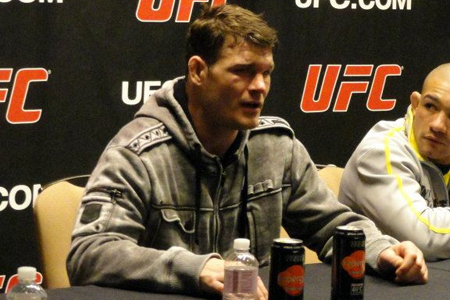 By the time the 2ndRound rolled around, Bisping was well aware his TUF 14 coaching counterpart was running on fumes. Miller hung on as long as he could, but was far too winded to defend himself from “The Count’s” onslaught in the 3rdRound. Their grudge match was called at the 3:34 mark in the third stanza. “The Ultimate Fighter 14 Finale” took place inside The Pearl at the Palms Casino Resort in Las Vegas, Nevada.